Nevada’s Senate Judiciary Committee http://maientertainmentlaw.com/?search=women-propecia unanimously approved a bill on Thursday that adds attacks on transgender persons to a list of hate crimes and stiffening the penalty for offenders. 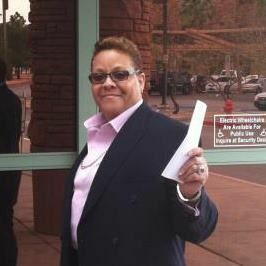 SB139 was sponsored by Sen. Patricia Spearman (D-Las Vegas). Spearman is a North Las Vegas pastor and is the only openly gay member of the legislature. She spent 29 years in the US Army, rising to the rank of lieutenant colonel. She told the committee of being the victim of a hate crime when she was 21 and was attacked by a truckload of young white men accosted her, a young black woman out jogging, tossing racial slurs and glass at her. [T]he only thing that saved my life was my ability to belly crawl in a ditch at least seven blocks to get to home. The measure will now proceed to the full Senate for a vote. It allows an additional sentence of up to 20 years if the attack was motivated by an victim’s transgender status. The victim would also have the opportunity to file a civil suit against a person convicted of such a crime. “Gender identity and expression” was added to the existing state hate crimes law which covered race, color, religion, national origin, physical or mental disability and sexual orientation. Sen. Greg Bower (R-Reno) stressed that the legislation “does not give special rights to any group.” After conviction the judge would have to determine if the offender singled out the victim because of gender identity. Committee members did question the value of adding gender identity to the hate crime law. Is this an important symbolic move or do you think there is a deterrent effect to this as well? Spearman said that the bill would have a real deterrent effect. We can always say that, do we need to add something else to hate crimes. But whenever crimes are committed by perpetrators and they are clearly committed only on the basis of a particular aspect of that person’s characteristics, then I think justice requires us to act. The bill also requires the state’s Department of Public Safety to compile statistics on such crimes for the purposes of reviewing evidence of prejudice. enter site Testimony to the committee was delivered by Elvira Diaz of Sparks, whose son Christian was born female. Diaz asserted that the law was needed to protect her son in situations where she was not present to care for him. Additional testimony was given by Z Shane Zaldivar of Sparks, who is now legally a man and is married. I’m a former marine. I’m a husband, a son, I’m a friend. I work in my community to make it better. I’m also a trans man. The only fear that I have is that I know there is going to be a day when somebody, the wrong person, figures out that I am not who they don’t feel that I am. A hate crime is a hate crime, and to exclude the transgender community just reinforces their thought that we are second-class citizens. I unfortunately don’t have enough hands to tell you how many of my personal trans friends have been beaten. There was no testimony against the bill. Committee Chair Tick Segerblom said he expects passage of the bill this session. A similar bill failed by a vote of 10-11 in 2011 when Sen. John Lee (D-North Las Vegas) joined Republicans to oppose the measure, which was jointly offered with a bill establishing protections for transgender people in employment, housing, credit and public accommodations…which did pass. Spearman successfully primaried Lee in 2012 and then won the seat in the general election. Performing an act motivated by nationalistic, racial or religious hatred, or hatred due to different sexual orientation or gender identity against a victim, is considered an aggravating circumstance and the sentence cannot be suspended.